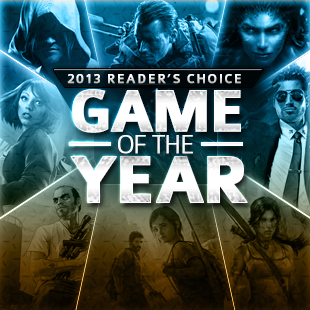 The first round of matchups lets you vote for your favorite title as games go head-to-head in The Escapist Reader's Choice Game of the Year 2013. Shooters shoot it out: BioShock: Infinite versus Call of Duty: Ghosts. Open worlds collide: Grand Theft Auto V versus Dead Rising 3. The little monsters of Pokemon X & Y versus a little game called Tomb Raider. The first round of The Escapist Reader's Choice Game of the Year 2013 is filled with crazy matchups Which game will make it to the next round? You can decide by heading to the official bracket to begin picking games now! As of this morning, voting is open, so head to our Reader's Choice GOTY page to let your voice be heard. And if you want to make sure your favorite game wins, you have until Tuesday, December 10th at 11:59pm EST to get your friends to vote! Papers, Please, anyone? Vote for your favorite game now in the first round of The Escapist Reader's Choice Game of the Year 2013. We've got some very hotly contested matches already. There's only a few votes in so far, but in the battle of the Quatros, it looks like Saints Row 4 barely beating out the pirates of Assassin's Creed 4. And Sony's flagship Killzone: Shadow Fall is narrowly losing to Battlefield 4. If any of that sounds off to you, you better head over and vote now! And if you'd like to duke it out in the forums about which game deserves to move on to the next round, feel free to visit the dedicated forums. We love good arguments! And we've created threads for each of the matchups so speak your mind.